Harold Horsley Aged 32 of Pit Lane Smalley. Willis Fowkes Aged 30 of Stanley Common. William Turner Aged 29 of Smalley Lees. Frances Reginald Abbot Aged 23 of Parkfield House Smalley. Harold was employed as a joiner and Staffman for the Company. Being a member of the colliery St John Ambulance Brigade and the Mines Rescue team, he was just the type of man that the R.A.M.C. required. 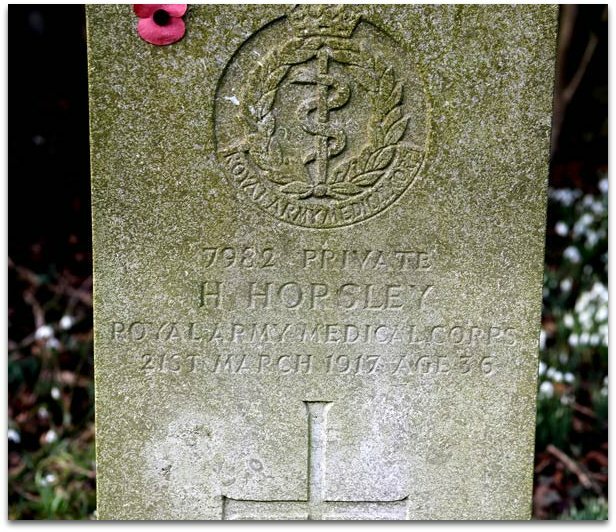 Signing on so early in the war he was posted for duty as a hospital orderly on H.M.H.S. 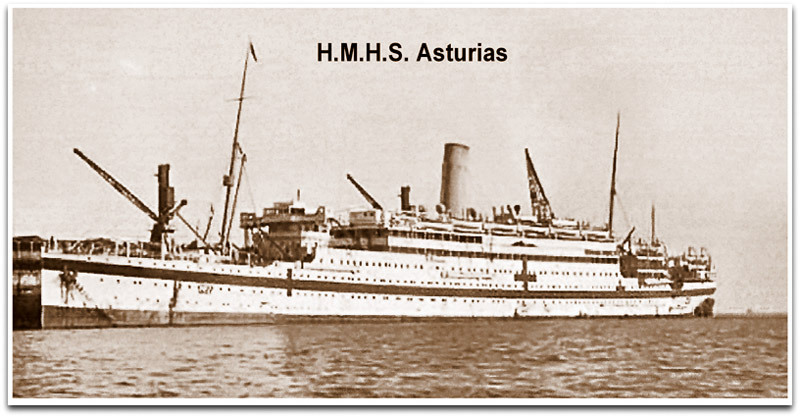 Asturias in September 1914, remaining with the ship to the end, being on board when she narrowly escaped sinking on February 1st 1915. She had accommodation for 896 patients, but on one occasion carried 2400 sick and wounded back home from the front. In early March 1917 she had landed wounded at Avonmouth. On completing this task the ship set sail, returning round Cornwall for her base at Southampton to replenish supplies. Approximately 5 miles off Start Point in Devon nearing the closing hours of March 20th 1917, the ship was rocked by a large explosion. A German U-Boat had fired a torpedo at Asturias which damaged her rudder and passed into the engine-room causing severe damage and knocking out all electric lighting throughout the ship. Distress signals were answered and a patrol boat towed in several life boats containing survivors. Between three and four hundred were landed, many being cared for by waiting residents from the locality who rushed to help at the scene. Many survivors were thinly clad, suffering from exposure and injured by the explosion. Three died after being landed. A second Patrol Boat and a Destroyer helped in the rescue. Medical Services: Dead 11. Missing 3 (including 1 female staff nurse). Injured 17. Crew : Dead 20. Missing 9 (including 1 stewardess) Injured 22. Many of the deceased crew were buried in Southampton Old Cemetery. Then the disaster was brought home when it was announced that the body of Harold Horsley had been washed ashore and an inquest had identified the body. His remains were placed in an elm coffin and sent home by train arriving at Coxbench Station. From here it was taken to “Fountain House”, Horsley the residence of his wife’s family. Alice Harrison Horsley (widow) 35. George Fredrick Horsley (Freddie) son 14. Eliza Horsley (Lila) daughter 12. Jessie Harrison Horsley daughter 9. Harold Horsley (Jacky) son 8. Family members attending the funeral were Harold’s father and mother, John and Amy Horsley of Town Street Horsley Woodhouse. Thomas Horsley (Headmaster) with his wife. (Brother and Sister in Law from Langley Mill). A full Military Service was accorded, to respect this gallant soldier. Employers and his fellow workmen joined his relatives and friends. The Service was conducted by the Reverend S. Rhys Williams, Vicar of St Clement church Horsley, assisted by the Reverend Bertie Phelips Vicar of Smalley. (He was the Vicar of Smalley throughout the First World War years 1906 – 1918). Three volleys were fired over the grave, and the “Last Post” was sounded. The firing party provided by the Officer commanding troops at Ilkeston. The Mapperley Colliery Ambulance Band attended playing appropriate music throughout. Members of the Mapperley St John’s Ambulance Brigade acted as bearers. A gratifying but melancholy feature was the presence of 6 survivors of the tragedy. This included Harold’s three comrades from Smalley: Willis Fowkes, William Turner and Frances Turner, two members of the R.A.M.C. from Tibshelf and another survivor arrived from Leeds. All attended to pay respects to their departed comrade. Harold Horsley is one of the 66 names listed on the Mapperley Colliery war memorial located near the church gates at West Hallam. She was built in 1907 for the Royal Mail Steam Packet Company. Sailing between Southampton and Buenos Aires. Following the declaration of war with Germany in 1914 she was requisitioned by the Admiralty, converting her into a Hospital Ship. On completion she was handed over to the Army soon making regular crossings bringing back the wounded from the Western Front. Converted to Accommodate 896 patients. During the Dardanelles Campaign she served in the Eastern Mediterranean returning wounded from Gallipoli, Egypt and Salonika to the U.K. The ship was unsuccessfully attacked on February 1st 1915. After the March 20th 1917 (see above) attack she was declared a total loss. Even with extensive damage Asturias was towed to shore and beached off Salcombe. Later being towed to Plymouth and used as a floating Ammunition Store were she stayed for the rest of the war. In 1920 the hulk was towed away and rebuilt as a Cruise Liner renaming her “Arcadian”. Operating Mediterranean and West Indies cruises until 1930. This was a short term project the ship being finally scrapped in 1933. The Central News Telegram Service reported “Austurias” had no wounded on board at the time of the attack. 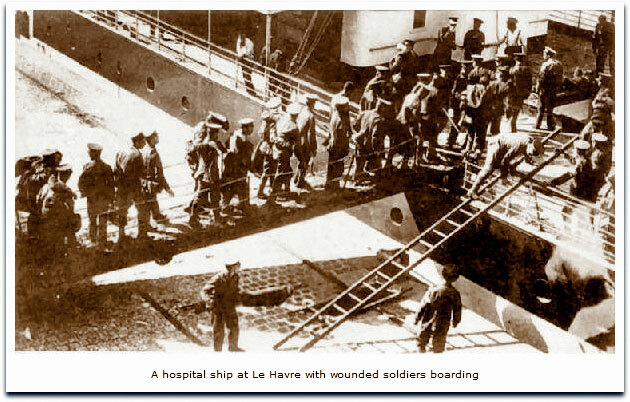 Before this latest attack the last hospital ship sunk by torpedo was the “Braemar Castle”, in the Eastern Mediterranean. The “Austurias” had been unsuccessfully attacked in 1915. Hospital Ships were easy targets for the German submarines. Even if the ships sailed with a long broad Green Stripe and illuminated Red Crosses as the Geneva Convention stipulated.